The word “weather” is a hyperlink, as though they have some scientific explanation of weird weather, but they mislead us again. You end up on a general weather page that doesn’t mention weird weather. I’ve learned that the strange melting episode affected only the very surface of the ice cap, which re-froze within hours. The melt was caused by a warm weather system which is not unusual – it occurs about every 150 years. But “global weirding” is the new codeword for global warming, and it’s applied to any slightly unusual weather event. Try it yourself the next time it rains when you hoped for sun, or fog appears just when you wanted rain. Call it global weirding and notice how people listen to you. Magic! Anyway, this slight mid-summer melting is not because of anything we’ve done and there is no need for alarm. But the ice cap has lost about 36 billion metric tons of ice a year recently. It sounds a lot, but let’s put it into perspective. The first question in my mind is: how does the loss compare to the mass of the whole ice cap? It’s easy to find out. Wikipedia tells us that the volume of the Greenland ice cap is 2,850,000 cubic kilometres, or 2.85 × 106 km3. It gives values for the density of glacial ice from which I chose 850 kg/m3 (less than liquid water at 1000 kg/m3. Finally, there are 109 cubic metres in one cubic kilometre. It’s currently losing 36 billion tonnes per year. Or, a 2,420,000,000,000,000 kg ice cap is losing 36,000,000,000 kg per year. I calculate that to be an annual loss of 0.00148% of the ice cap. That’s not very much at all, Winifred. Quite trivial, in fact. Correct me if I’m wrong, but it seems that at that rate there are only 67,222 years of ice cap left. Oh dear. I wonder if we could get the mainstream media to publish this alarming news? What if we just mentioned that it’s melting, without pointing out how slowly? They’d probably fall for it – their reporters don’t know any maths. Wow, that article has to be read to be believed, or maybe I should say you shouldn’t believe everything you read. Especially when it uses such alarming demagoguery. Maybe we should call the magazine ‘Fearmongering American’ from now on? That is an extremely fast rate of melting in geological terms. To put things in perspective, Homo sapiens have been around for over 60,000 years. Are we not likely to be in the next ice age when this figure rolls around? Still too slow, Simon. You see, the alarmists are demanding we stop it immediately because it’s our fault. Do you think we can? Do you think it is? I think it’s a scare story. There’s no way we can melt 2420 trillion tonnes of ice with our puny smokestacks and exhausts. Yes, and that’s the other thing. Survival is likely to be on our mind very strongly and it’s doubtful we would care if a piece of the damnable ice was melting. Melt it all, we’d say. Someone switch off that dang meltdown alarm. The naturally inquiring mind naturally asks the question you have asked – is that a significant amount and should I be worried? Unfortunately most people take it as presented and propoganda does work, at least for a period of time. Perhaps we could come up with a few of our own alarmist one liners. Richard C is likely to take you to task for fitting a linear trend to what appears to be a clearly accelerating ice loss. He is generally quite passionate about the subject. Had you considered including the acceleration of the ice melt in your calculation? The acceleration is quite pronounced and gives a very different result. You might also want to consider converting it into meters of sea level rise by 2100 to put it into perspective. I’ll have a go at the calculation myself in the next couple of days so don’t panic if you don’t have time to look at it yourself but I would appreciate a independent check. Richard C is likely to take you to task for fitting a linear trend to what appears to be a clearly accelerating ice loss. Since I haven’t even provided a graph, much less a linear trend, I must assume you’re referring jocularly to my calculation of how long the ice will last. Ha, ha. The authors say the rapid melting that has made headlines in recent weeks also is likely to slow or stop. Their conclusion also contradicts widely-reported predictions that the accelerating ice melt will trigger a significant rise in global sea levels. My calculations provided some perspective for the recent annual loss, not a prediction, and acceleration wasn’t considered. There was no mention in the abstract of an acceleration. In fact, that’s right, the study was reporting the opposite: a slowdown in melting with perhaps a halt to come. The paper you cited shows similar ice loss, at about 36 Gt/yr, but shows mass loss increasing in some areas and decreasing in others, causing doubt about the future. I’d appreciate an independent check of my figures, too, so help yourself. I don’t know how to reconcile the differences between these papers. Relax Nick, no need to get into serious speculative extrapolation. Greenland meltdown could happen in only 67,000 years! Simon, remember that it was SciAm who claimed 36 Gt annual ice loss, it was SciAm who described it as a “meltdown” and it was SciAm who failed to mention the paper said the melting was slowing down and might stop. I don’t claim the 36 Gt is correct and only use it to examine what SciAm said. I disagree with you: it’s not clear that ice loss is accelerating. In the paper you cite, I lack the ability to understand the modelling details. But I would urge caution in assessing any conclusions from modelling, any assumptions based on the warming potential of CO2 (this paper’s riddled with it) and any conclusions substantially at variance with observation. For example, this calculates that the ice sheet is 33% larger in volume than observation shows us. So, again, acceleration is not a bit clear. Or are you denying that disagreement? No, the degree of acceleration is a moot point. What everyone agrees on though is that the Greenland ice sheet is decreasing over time. It is a good indicator of climate change and the introduction of large volumes of cold water into the northern ocean could cause problems in the future. What Kurt Kjær, Shfaqat Abbas Khan and Kristian K. Kjeldsen are saying is that the recent observations are merely part of a cycle (nothing extraordinary) and that they predict a return to a benign regime in due course. It is a good indicator of a natural cycle taking place and the introduction of large volumes of cold water into the northern ocean has all the effect it will have right now in the present. That could be said of ALL IPCC projections. A guess at the future using a sophisticated supercomputer and programming is still a guess but an IPCC guess “suddenly becomes a “fact”” too – and we are paying for that “fact” by carbon taxes. In the IPCC climate case, a crude guess is given the illusion of a sophisticated.guess by the implementation and duplication of some very expensive technology. Policymakers just would not have been impressed by back-of-the-envelope guesses, instead they’ve been fooled by an illusion of ordinary every day guesses masquerading as sophisticated science. Not only has the water vapour amplification been proven NOT to exist but “contemporary” climate science has reversed the sign of the classical negative water vapour feedback to positive, fooling themselves and subsequently policymakers in the process. For a short time Simon – it’s cyclic. It’ll be back circa 2140 but we wont be debating it. It’s quite interesting to hear different perspectives on the amount and progress of the warming, though, as everyone knows, the only reason we’re discussing it is because we’re trying to stop the warming because we think it will become dangerous. But we cannot do that if we don’t know the cause of the warming. What is it? During the ~63 year period (1930 to 1992) cooling prevailed that can be attributed partially to an increases in atmospheric aerosols that reduce surface insolation. Liepert et al (2002) estimated that there a global reduction of about 4% in solar radiation reaching the ground between 1961 and 1990. So here we have a major natural variation but its effect is “unclear”. No similar uncertainty by Box though about the “…ongoing and intensifying anthropogenic global warming (AWG) owing to a dominance of enhanced greenhouse effect”. That’s the same “enhanced greenhouse effect” that John Christy shows is present in the CMIP5 model simulations for AR5 but not in reality. And here’s the little problem for aCO2 attribution in the Arctic. And Barrow CO2 1974 – 2007 increased identically to Mauna Loa over the same period. So why didn’t Tropics and Arctic temperatures rise in concert if CO2 is the driver (they didn’t in the satellite record)? 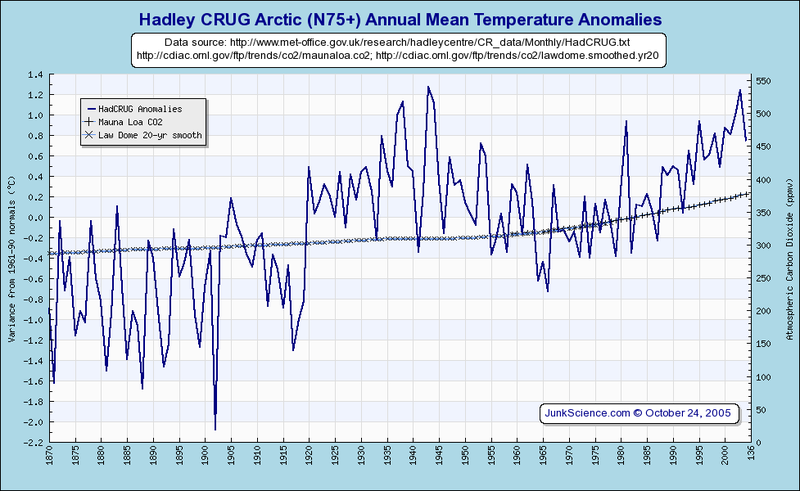 Hadley CRUG Arctic vs CO2 shows no correlation.especially the regime change around 1915. I think we can conclude that CO2 is not the Arctic driver. Until they can get their 3 month forecast right there’s not much to be taken from UK Met predictions. We haven’t forgotten their “barbeque summer” or the wettest drought ever. Hi all, there seems to be a bit of confusion here due to the fact that the Kjaer paper refers only to the Northwestern ice sheet so it is perfectly possible that the ice loss has slowed on the Northwestern ice sheet while the accelerating loss shown by the satellite data continues over the whole of Greenland. Has anyone found a full text version of the Kjaer paper? I’m not comfortable drawing any particular conclusions from it based on only the abstract or various media interpretations of it. 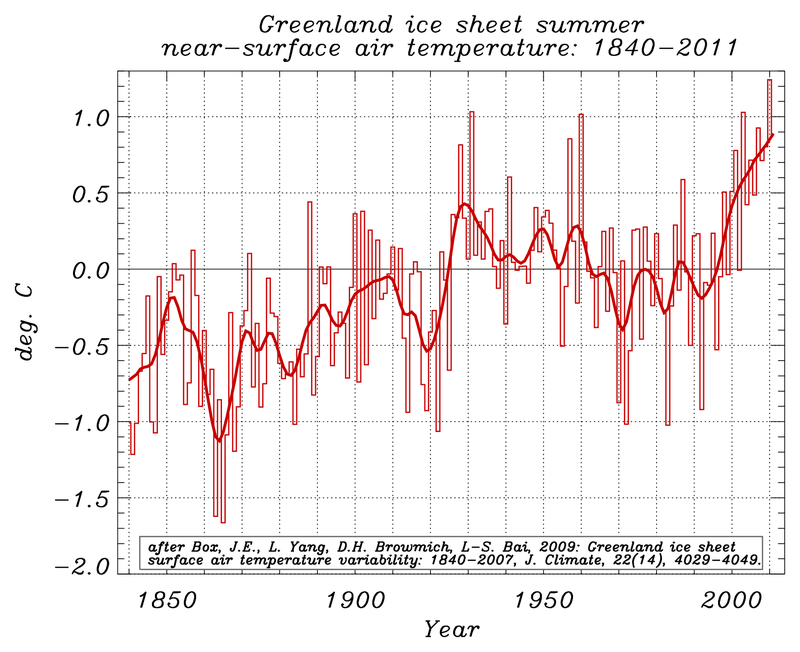 As for the surface melting event that covers the entire Greenland ice sheet it is certainly not unprecedented but it does not happen periodically every 150 years. The 150 figure is the average over the past 10,000 years which includes a much higher frequency in the distant past (when summer insolation was higher). The average period over the last 3,000 years is more like 250 making this event unusual. The paper also shows that 3 melt events in 100 years would be unprecedented in the last 5000 years and five events within 100 years would be unrepresented in the whole 10,000 year record. So while you might write this event off as a freak event, if it happens a couple more times before 2112 that if would be serious cause for concern. Btw if the current rate of accelerating ice loss over the whole of the Greenland ice sheet continues by 2100 we would be losing 2232Gt/y of ice per year and the sea level would have risen by approx 30cm (not accounting for thermal expansion or the effect of other ice sheets). Please note that this is in no way a prediction. I merely wish to illustrate the difference between linear rates of ice loss that Richard T characterised and the accelerating loss which we are currently seeing. That is, you can speculate all you like Nick (as the IPCC does) but first you have to explain why your “serious cause for concern” (a supposed accelerating Greenland ice melt) is having the result of a decelerating SLR. It will be interesting to see what IPCC AR4 makes of Boretti 2012 (if it even makes it). Well a 5 – 10 year trend is hardly convincing. There are numerious effects that will distort the signal over such short time frames. Once again if you have a link to to the full paper that would be helpful so we can see if the have allowed for the inverse barometer effect etc. I prefer not to rely on someone else’s interpretation. In any case I’m not sure why you would expect to see the effect of Greenland’s accelerated melting in global sea level rise when Richard T has already shown that the current level of melting is not adding a huge amount to global sea levels. If the accelerated melting continues in Greenland by the end of the century it will be a different story. I would have thought it would be wise to focus on leading indicators (such as accelerating ice sheet loss) rather than waiting until accelerating sea level rise is locked in before admitting that maybe we have a problem. Enough time has elapsed for your “leading indicator” to produce an effect in SLR but instead we see the opposite. You seem intent Nick, on perpetuating an alarm scenario as if your career and reputation depend on it. The trend is over the entire 18 year satellite record. Just corroborates my own TOPEX/Poseidon/Jason-1/2 trend analysis that I’ve provided for you previously Nick so this shouldn’t be news i.e. anyone can do it, just that Boretti has now formalized it in the peer-reviewed literature. This is just a personal interest, I am just trying to present facts and avoid confirmation bias by discussing them with people who hold an opposing opinion. Sorry if you find it alarming. I’m not really sure what your point is. Are you claiming that Greenland isn’t melting? That it is but the rate is not accelerating? Or that melting ice sheets do not contribute to sea level rise? Could you please clarify what you are trying to say? It’s cyclical so there will be occasions when it’s in states of acceleration, deceleration or inflexion i.e. phases. Any extrapolation (projection) of SLR must be along Boretti’s 3rd order polynomial (statistically) which actually reduces SLR concern from a benign normal rather than elevates it to anything extraordinary. That is until such time as SLR exhibits something other than Boretti’s trend – that may take another 18 years to ascertain. REPLY: RC, you work incredibly hard to contribute here, so please stop poking people. (“I hope you’re not denying this peer-reviewed paper Nick) There’s no need — the research you do is enough, man! – Richard T.
Do you really believe that there is a significant difference between an R² of 0.94967 and 0.9412? Extrapolation of multiple order polynomials can lead to extremely misleading results. Thanks for the clarification. I’m glad to see we agree that Greenland is melting at an accelerating rate. Obviously we disagree about what is likely to happen in the future. I suspect that melting will continue to accelerate due to warmer seas at least until the ocean terminating glaciers retreat onto land. It is not yet clear to me what the effect of increasing albedo will have but it is possible that this will become the dominate driver of melt and it is not obvious what the results of this will be. On the other hand you believe that the current accelerating melt in Greenland is cyclic and that it will reverse at some point. Could you please discuss some of the evidence that has led you to this conclusion? Perhaps you could start by telling me what you think is causing the current melting and why this driver is about to reverse? Greenland ice conditions are in a cyclical phase, what will happen in the next decade is speculation by everyone because no-one really knows but there’s no alarm anyway. Speculation about what will happen in 2100 is plainly a matter of opinion – not science. B) There’s no anthro cause for atmospheric conditions in the Arctic as can be seen from the temp – CO2 comparisons up-thread. Strong positive phases of the NAO tend to be associated with above-averagel temperatures in the eastern United States and across northern Europe and below-average temperatures in Greenland and oftentimes across southern Europe and the Middle East. They are also associated with above-average precipitation over northern Europe and Scandinavia in winter, and below-average precipitation over southern and central Europe. 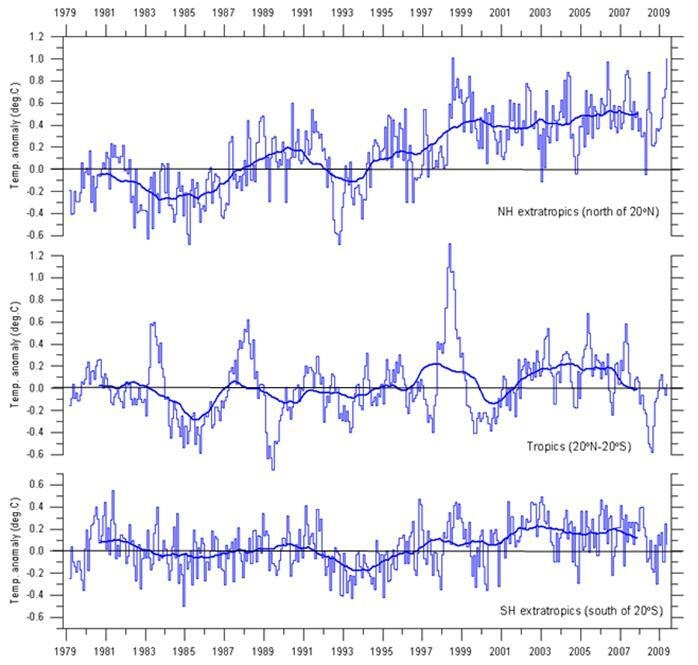 Opposite patterns of temperature and precipitation anomalies are typically observed during strong negative phases of the NAO. During particularly prolonged periods dominated by one particular phase of the NAO, anomalous height and temperature patterns are also often seen extending well into central Russia and north-central Siberia. But the melt is on a much longer cycle (about 153 years) than is the NAO which is short duration and varying wildly. processes of the Earth and the Sun synchronize to them. Sorry if I misinterpreted what you were saying. Can you please share the data you have that shows that the Greenland ice sheet is melting but the rate is not currently accelerating? You seem to be saying that NAO it is so variable that it isn’t the driver of the increased ice loss we have seen over the last few decades. I agree with you on this point. However I don’t see any evidence of a 153 year melting cycle. Could you please clarify where you got this period from? Finally you seem to be claiming that the melting is caused by the vibration of the solar system but you have not been able to find any correlation between these postulated vibrations and the observed melting. Given this lack of observed correlation how do you know that this melting is about to reverse rather than continuing to increase? The distinction should be made between decadal/multi-decadal and annual surface melt (NASA’s Koening refers to annual melt below from the NASA Press Release), the latter annual event is clearly not accelerating but just a normal cyclical aberration. 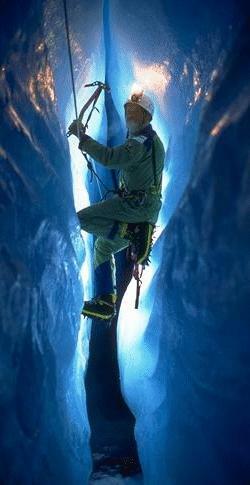 “Ice cores from Summit show that melting events of this type occur about once every 150 years on average. With the last one happening in 1889, this event is right on time,” – Lora Koenig, a Goddard glaciologist and a member of the research team analyzing the satellite data. Kurt Kjær, Shfaqat Abbas Khan and Kristian K. Kjeldsen have investigated a multi-decadal timeframe. Give it time Nick, that’s the job of specialist scientists not me. When someone comes up with something I’ll let you know but given the superior performance (compared to IPCC GCMs) of a cyclical model then cycles are the sensible place to look. Note that Scafetta initially excluded secular and millenial cycles as explained here http://wattsupwiththat.com/2012/03/11/scafetta-prediction-widget-update/ but he’s subsequently progressed things a bit with Craig Loehle. I think the HadCRUT3 quadratic basis is flawed but that’s another story. Maybe you could have a look at the comments I made above. The Kjær paper deals only with the Northwestern part of Greenland and can’t be taken as a proxy for the whole. Satellite data and mass balance calculations over the whole ice sheet show acceleration. Perhaps you could address these points. As it stands your claim of no acceleration and that a surface melt event every 150 years is to be expected appears to be unsupported by the actual literature. I think 153 years is the time lapse since the last event and the long-term average may be 250 years but so what? The annual surface melt aberration is cyclical i.e. not unprecedented and to be expected, “…this event is right on time” as Lora Koenig of NASA puts it. “Along the K-transect the surface mass balance (the balance between snowfall (positive mass) and melt water runoff (negative mass) during 2010-2011 was less negative than the previous record-breaking year (2008-2009)”. No acceleration. Increasing 1958 – 1974, no change 1974 – 1994, decreasing 1994 – 2010. No acceleration and no anthro attribution. The study only begins in 2003. They say “2005-2006 had almost as much mass loss as 2010-2011”. No short-term acceleration. That earlier event would also discount anthro cause. ABSTRACT. Mass loss from the Greenland ice sheet over the past decade has caused the impression that the ice sheet has been behaving anomalously to the warming of the 1990s. We have reconstructed the recent (1866–2005) surface mass-balance (SMB) history of the Greenland ice sheet on a 55km grid using a runoff-retention model based on the positive degree-day method. The model is forced with new datasets of temperature and precipitation patterns dating back to 1866.We use an innovative method to account for the influence of year-on-year surface elevation changes on SMB estimates and have found this effect to be minor. All SMB estimates are made relative to the 1961–90 average SMB and we compare annual SMB estimates from the period 1995–2005 to a similar period in the past (1923–33) where SMB was comparable, and conclude that the present-day changes are not exceptional within the last 140 years. Peripheral thinning has dominated the SMB response during the past decade, as in 1923–33, but we also show that thinning was not restricted to the margins during this earlier period. Have another look at the MAR simulation section in the Arctic Report Card and have a think about whether it shows accelerating or constant mass loss. I’m happy to explain it to you but I figure you just misread the y axis. -150 to 0 is an increase from where it was at 1958 back to the normal, 0 to 0 is no change from the normal, 0 to -300 is a decrease from the normal. That is of course, unless an anthropogenic effect begins at 1994 for some inexplicable reason. Do you realise that the y axis is Surface Mass Balance rather than total ice sheet mass? That is why the units are Gt/Yr rather than Gt. To clarify 0 means that there is no change in the total mass, not that the ice sheet has returned to the baseline mass. -100 (say) means that the ice sheet is losing 100Gt/yr. A positive value of 100 would indicate that the ice sheet is gaining mass at 100Gt/yr. From the start of the record until 1974 the line slopes up until it reaches 0. This indicates that the ice sheet continued to lose mass but the rate was getting slower, that is decelerating ice loss. From 1974 until 1994 the line hovers around 0 indicating that there was no significant ice loss or gain. It tell us nothing about the total mass of the ice sheet although you could infer it with integration if you so wished. From 1994 the total Surface Mass Balance slopes down meaning more ice is lost each year than in the previous year. This is acceleration in the rate of ice loss, I fail to understand how you can characterise it as anything else. I suspect you are confused because you are expecting to see a curving line to represent acceleration. In fact since the y axis is already a rate rather than an absolute measurement any sloping line represents a changing rate which is the definition of acceleration or deceleration. This is a decrease from the norm as I said, is it not? This is no change from the norm as I said, is it not? This is an increase from the norm as I said, is it not? 1) Anthropogenic attribution – there isn’t any. How can the rate be decreasing since 1994 but mass loss is not accelerating? Or do you agree that currently mass loss on the Greenland ice sheet is accelerating according to the MAR simulations? 1992 and 1996 are years of positive growth from the anomaly baseline of SMB.beyond 2-sigma. The SMB line moves from negative growth 1958 to positive growth from the anomaly in 1965 and back to negative growth from the anomaly in 1966ish. Similarly, SMB moves from positive growth from the anomaly in 1996 to negative growth in 2010. The current 2000 – 2010 negative anomaly is not unprecedented because the same thing happened around 1958. The positive accumulation around 2000 offsets the negative accumulation around 1970 and we’ve got some way to go to match 1970 levels. In any event the scare is over – no anthro attribution – no SLR effect – case closed. I find it fascinating that we can look at the same graph and see different things. In some ways this cuts to the heart to the two sides of the debate. Let’s stick to the MAR simulation data since 1994 which you say shows no acceleration. Change in rate (in this case Gt/yr) over time (Gt/yr^2). Could you explain how this rate change occurred if it did not accelerate? Perhaps it would help if you defined your understanding of acceleration from first principles as I have done above. Nick I’ve already laid out the case that the current situation is not unprecedented and nowhere near yet the levels of 1970 after the 1920 – 1960 event. There’s no anthropogenic attribution, no effect on SLR and therefore no scare. If you wish to deny all of that and prefer to revel in an irrational state of apprehension, feel free to do so – just don’t expect everyone to join you. Richard C, accusations of denial and irrationality are unnecessary. Claiming that there is no acceleration in mass loss because the “current situation is not unprecedented” is not sound logic. Once again how exactly do you define acceleration? But you accept that the current ice loss in Greenland is accelerating? Questions of precedent and attribution can be addressed next. That is 36Gt/yr is only for part of the Greenland ice sheet. This makes your estimate for the length of time till the ice sheet disappears too high by about an order of magnitude and this still ignores the accelerating melting. Unfortunately this means the title of the whole thread needs correcting which sounds like a bit of an administrative pain. Perhaps a new post with the corrected calculation would be more appropriate? Explains why extrapolation of the recent event has been described as “naive” by Pat Micheals. Perhaps a new post with the corrected calculation would be more appropriate? Yes, the original was focused on that area. My article still puts the melting into a useful perspective. But as I asked you earlier, do you think the melting is our fault and do you think we can stop it? How would you correct the article? Maybe Nick can vet all future blog posts for accuracy and correctness of titles. I am sure he would be delighted to take on this unpaid work in the interests of a fair and unbiased blogosphere. The Grace satellite data for example finds a loss of 430Gt in the 2010/2011 year. Alternatively if you are determined to reference the Scientific American article then you could figure out how big the North Western ice sheet is and apply your calculation to that. As for attributing causes to the melt I am sad to say that I think it is likely to be anthropogenic in origin. As for whether we can stop it only time will tell, it would be nice to at least try though. It is often surprising what can be achieved once humanity sets it’s eyes on a goal, the Curiosity Rover and the discovery of the Higgs boson are just two recent examples. If you are referring to Frauenfeld, O.W., P.C. Knappenberger, and P.J. Michaels, 2011. A reconstruction of annual Greenland ice melt extent, 1785-2009 then keep in mind they are referring to melt extent rather than mass balance and acceleration. They are not the same thing. As far as I can tell the accelerating loss of ice mass is unprecedented. As for attributing causes to the melt I am sad to say that I think it is likely to be anthropogenic in origin. Is this a “gut feeling, no science” (to paraphrase Phil Jones), or do you have something more to go on? Regarding the Frauenfeld et al. (2011) paper I believe you are referring to (correct me if I’m wrong) the authors themselves say that 2007 had the highest melt extent in their 228 year record which ended in 2009. 2010, 2011 and 2012 had higher peak melt extents than 2007 so I would definitely say that the recent extent of melting was unprecedented. The current rate, acceleration and extent of melting is unprecedented over the instrumental record. I suspect that it may be unprecedented over the geological record as well because the forcings that caused previous melt events are not present in this instance. Feel free to share any peer reviewed evidence that you believe shows otherwise. Feel free to share any peer reviewed evidence that you believe shows otherwise. Maybe you could show me how you attributed the current melt to anthropogenic causes, peer reviewed of course. Nope, happened before starting 1920s. Accumulation reached a low 1970. We’re nowhere near that at present. You are aware that accumulation is different from acceleration right? If the figure you want to discuss shows acceleration from 1920 then let’s discuss it, but can you please fix the link first. It is already happening! What if the albedo feedback loops are so strong that the existing climate models are too conservative? There are phases. If acceleration occurs, whether positive or negative, then accumulation depends on the state of phase: loss 1920 -1970; then accumulation 1970 to 2000; then loss again 2000 to present. No it doesn’t, it’s an accumulation figure that shows loss – gain – loss as a result of phases. The first loss being far greater than the current loss. We have raked this topic over some time ago with the same graphs Nick. Why do you insist on ignoring that which is contrary to your obvious bias so that we go over and over and over and over the same ground – it’s getting tiresome. Thanks for clarifying the graph you are talking about. I note that it ends in 2010 with accumulated mass only about 285Gt greater than the minimum around 1970. Given that the mass loss in 2011 was 344Gt (according to the Arctic Report Card) it would seem that the current loss of accumulated ice is now also unprecedented over the instrumental record. I also see that the figure you refer to shows that we have lost almost twice as much mass in the last ten years as we did in the previous period of loss that you refer to (pre 1970) which was slightly longer. The low level of accumulated ice and the current rate, acceleration and extent of melting in Greenland is unprecedented over the instrumental record. “greater” ? Don’t you mean “less” ? The 1970 level is -900Gt, the 2010 level is -650ish. 900 Giga ton loss 1957ish – 1972ish (about 15 yrs from series start but what happened prior to that starting around 1920?). However, from 1985 – 1990 (5 yrs) the accumulation remained static at about 300 Giga ton gain but from 1992 – 1998ish there was a 700 Giga ton gain.in the space of 6 yrs. We will have to wait this current climate period to see if loss falls back to 1970 levels, extrapolation only gives misleading impressions depending on storyline. The fact remains that the largest observed movement has been a 1900 Giga ton gain over a close to conventional 30 yr climate period at a time when anthropogenic influence has been said to be paramount. Therefore, anthropogenic actions have resulted in Greenland mass accumulation using that rationale. Also opposite to alarming claims, neither the period of loss up to 1970, nor the present loss, has had an adverse effect on SLR, the latter having the perverse effect of SLR deceleration. Anthropogenic influence seems to have a beneficial effect on Greenland ice mass overall. 1) What anthropogenic actions caused the 1970 loss? 2) What anthropogenic actions caused the 2000 gain? 3) What anthropogenic actions caused the 2010 loss? I definitely mean greater. The accumulation level in 2010 is -650Gt which is greater than -900Gt in 1970. Of course the accumulation level in 2011 is -994Gt and this is the lowest level of accumulation on the instrumental record. So while you say “We will have to wait this current climate period to see if loss falls back to 1970 levels” we don’t have to wait another 20 years, the accumulation level is already lower than 1970. No extrapolation required. You also say “the largest observed movement has been a 1900 Giga ton gain” actually if you include 2011 the largest observed movement is the 1944Gt loss of mass between 2000 and 2011. This is about 3 times faster than the gain you cite. So the loss was “greater” than 1970 closest to the the anomaly mean, then it became “lowest” further away from the anomaly mean than 1970 – this is a bit woolly Nick. Why “of course” ? Where did you get “-994Gt” from ? OK, I see we are at total mass levels 150 Gt less than 1970ish. Mass fell sharply 610 Gt in 3 months June 2010 – September 2010 as it did in 2007. There were also sharp gains: 1972ish, 1983ish, 1992ish, 1995ish. So what we have is an overall cycle with sporadic sharp gains and losses. That’s going to make your anthropogenic attribution extremely difficult Nick – good luck with that (especially the +1050 February 2002 figure). Doing some long night shifts at the moment so now’s an opportune time to conclude. 1) Greenland ice mass is a natural cycle of as yet undiscovered cause. 2) Greenland ice mass loss or gain has no detectable effect on SLR. 3) In the timeframe of the “anthropogenic era”, Greenland ice mass is a non-issue. It’s a shame you have to take a break. I have certainly enjoyed spending the time researching this topic with you. Before we finish up let me just edit your comments slightly and add some of my own to more accurately portray the situation as I understand it. Thanks for your time on this issue, it is much appreciated and the discussion has broadened my understanding significantly. I agree with Nick on all counts. I also think that the increase of Greenland ice melt and the shift of the Northern jet stream are related although it is debatable which causes which. Hopefully 2012 is an outlier. If the 2013 northern summer is as extreme as 2012 you are going to get every AGW supporter saying “I told you so” and perhaps increased focus on climate change mitigation by the US and other affected Northern hemisphere countries. Thanks Simon, I appreciate the vote of confidence. The irony is that I had no idea how far into unknown territory Greenland was previous to this discussion. We are currently seeing events that are unprecedented in at least 8 generations. A little research into the peer reviewed literature is certainly eye opening. Maybe if Greenland keeps melting at this rate some more of the Viking artifacts will get uncovered. I am sure this will be a rich field to write some peer-reviewed papers on. Box [a polar scientist] had conservatively predicted that it might take up to a decade before the surface of Greenland’s ice sheet melted all at once. That it actually happened in just a few weeks only underscores how consistently cautious ice scientists have been in forecasting the threat posed by global warming. Now, however, that caution is being replaced by well-founded alarm. It actually shows how wrong the predictions were, doesn’t it? Also, it’s misleading, bordering on fraudulent, to say “before the surface of Greenland’s ice sheet melted all at once.” For the truth is the melting affects only the top few millimetres. 1. What caused the melting? ANSWER: Not global warming. NASA said it was: “an unusually strong ridge of warm air, or a heat dome, over Greenland. The ridge was one of a series that has dominated Greenland’s weather since the end of May.” In other words, an unusual weather pattern. Just like the US drought. 2. What happened after July 12? ANSWER: The water froze again as the temperature dropped. The scare has ended. NASA, clearly not experiencing McKibben’s fictitious “well-founded alarm”, also said that “Ice cores … show that melting events of this type occur about once every 150 years on average.” It is not unprecedented. Argue with NASA if you will. I’ll simply investigate anything blurted out by McKibben’s nervous temperament. I see McKibbon states “NASA reported”, so it’s just spinning the alarm spin (a doubling down if you like) already in the NASA PR (with the erroneous title). The benign and mundane was surreptitiously inserted in the NASA PR and selectively overlooked by RS and McKibbon, all.in the interests of creating a crisis. Nobody mentioned AGW apart from yourself. Albedo isn’t anthropogenic apart from the unknown amount of soot and pollution from man-made sources. The point is that there may be a positive feedback loop both in terms of increasing albedo further increasing albedo and the melting increasing the likelihood of warm polar highs over Greenland in summer. The jury is still out. if the Antarctic ice regions and the major Greenland icecap should reduce at the same rate as the present melting in the Arctic, oceanic surfaces would rise to catastrophic proportions and people living in the lowlands along their shores would be inundated. He said that temperatures in the Arctic had increased 10 deg. Fahrenheit since 1900–an “enormous” rise from a scientific standpoint. What’s your point? That in 1947 there was a quiet news day? I don’t see how this is related to the state of the Greenland ice sheet. All it does is speculate about what might happen if it were melting. Today on the other hand we have evidence that not only is it melting, the rate of melt is speeding up and the is less ice today than at any previous time on the instrumental record. Perhaps you could clarify the argument you are trying to make. Just the amusing juxtaposition of the 1947 melting event and the response to it with the 2012 event and response (never mind the intervening growth). A bit like the 70s global cooling scare vs the 90s global warming scare. Just poking a bit of fun at your expense Nick. It is “the absence of actual science” that does support my position Nick. The absence of detectable SLR as a result of melting. That 40s warming might just have had something to do with 40s Greenland melting though and the 70s cooling might have something to do with the mass growth, I don’t know – there’s an “absence of science”. So during that scientific absence, I’m filling in the time with the humourous aspect.of it all until something conclusive turns up. I think I’m going to need some more material.